Apple senior vice president of software engineering Craig Federighi announced at Tuesday’s special event that OS X Mavericks will arrive on the Mac App Store on Tuesday, October 22. Even more significant, it’s going to be free. Mavericks brings several key under-the-hood features to OS X, new versions of popular Apple iOS apps, and full support for multiple displays. Federighi briefly outlined some of the key technology improvements in OS X Mavericks, including better battery life for laptops, compressed memory to help lessen your computer’s memory load, and graphics improvements to make better use of both the memory and the CPU. He then rehashed some of the features first demonstrated during the 2013 Worldwide Developers Conference, including Safari shared links, enhanced notifications, Finder tags, multiple display improvements, and new Maps and iBooks apps. 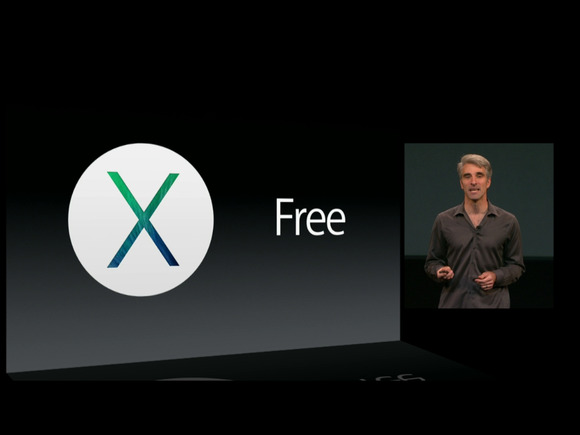 But Federighi’s OS X Mavericks presentation wasn’t limited to a simple features list: Federighi also took the OS for a test-drive onstage, opening a new version of the Pages app and building a presentation with help from iBooks. He also showed off a number of the previously mentioned features, with quips about his fashion style and Apple’s new spaceship campus throughout. OS X Mavericks will be available from the Mac App Store for free later this afternoon; you can download it using the Mac App Store application on OS X Snow Leopard or later. You can download OS X Mavericks on a 2007 iMac or MacBook Pro or later; a 2008 MacBook, MacBook Air, or Mac Pro or later; or a 2009 Mac mini or later. More to come as the event progresses. In the meantime, you can get your Mac ready to install OS X Mavericks with senior editor Dan Frakes’s guide, learn 12 things you may not have known about OS X Mavericks, catch up on our OS X Mavericks FAQ, or read more about OS X Mavericks’s new features.